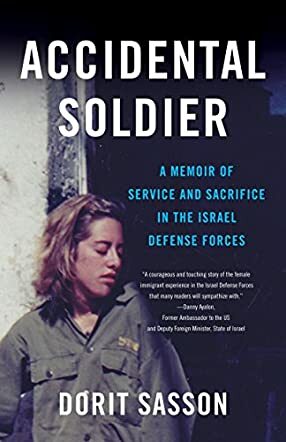 Accidental Soldier: A Memoir of Service and Sacrifice in the Israel Defense Forces by Dorit Sasson is a fascinating and well-written factual account of an important segment of the author’s life. When we first meet the textual Dorit, she is in her late teens, living in her hometown of New York City. She lives with her unbalanced and unreliable mother who has almost completely broken her daughter’s self-esteem. Dorit is incapable of making decisions or thinking for herself without first hearing her mother’s words in her head. Dorit’s father, an Israeli by birth, and her step-mother encourage her to put herself and her needs first. They recommend that she move to Israel to gain some perspective and make some positive decisions for her future. Dorit Sasson already speaks Hebrew and has relatives who live in Israel. She is afraid to leave New York, but she is equally afraid to stay. Finally, she makes a firm decision and moves across the globe to a new life as a soldier in the Israel Defense Forces, the IDF. The author does a wonderful job of recreating her younger self during her two years in the military, as the insecure Dorit grows into a confident and happy adult. The reader gets an inside look into life as an Israeli soldier, life on an Israeli kibbutz (commune), and what it’s like to move to a new country, making it your new home. Although there is a Jewish spin to the story, Accidental Soldier has themes that span across cultures, like living in a dysfunctional family, leaving home for the first time, becoming a soldier, trying to make new friends and fit in, and having the confidence to decide on an ultimate career path. This is an impressive story, well told.